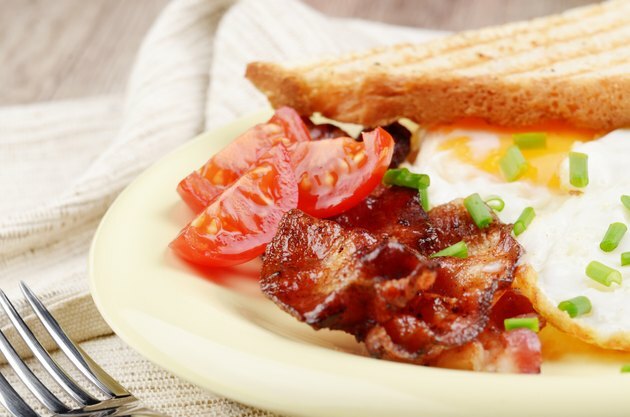 Bacon that has been fried until it is hot and crispy is part of a traditional hot breakfast with eggs, potatoes and pancakes, and bacon can also a source of crunch and flavor for sandwiches. Regardless of how you like to eat crispy bacon, this cured pork is not very nutritious. The best approach for most people is to eat only a small amount of bacon as part of a balanced diet. The nutritional information for crispy bacon is for a serving size of two slices, which weighs 16 g, or just over 0.5 oz. The bacon contains 84 calories, 6 g total fat and less than 1 g carbohydrate. It has 6 g protein. Crispy bacon has 18 mg cholesterol, which raises levels of LDL cholesterol in your blood, according to the 2010 Dietary Guidelines from the U.S. Department of Health and Human Services. Healthy adults should not have more than 300 mg per day. You can reduce the effect of dietary cholesterol on your blood cholesterol levels by eating a diet that is low in saturated fat. A 2-slice serving of crispy bacon has 2.1 g saturated fat. A diet high in saturated fat may increase your cholesterol levels and lead to heart disease. The recommended maximum of saturated fat for healthy individuals on a 2,000-calorie diet is 10 percent of calories from saturated fat, or 22 g per day, according to the 2010 Dietary Guidelines from the U.S. Department of Health and Human Services. Turkey bacon or vegetarian bacon may be lower in saturated fat. Crispy bacon has 384 mg sodium in a 2-slice serving. A high-sodium diet can cause high blood pressure and a higher risk for stroke, and the 2010 Dietary Guidelines from the U.S. Department of Health and Human Services suggest limiting intake to 2,300 mg sodium per day to maintain a healthy blood pressure. Salt used for flavoring is a source of sodium in cured meats, such as crispy pork bacon. They may also contain sodium nitrate, which is a preservative that may increase your risk for heart disease, according to MayoClinic.com. Crispy bacon has 1.8 mg niacin, or 9 percent of the daily value. Niacin, or vitamin B-3, is necessary for proper energy metabolism and healthy skin, according to the Linus Pauling Institute Micronutrient Information Center. In comparison, a cup of fortified cereal has about 20 mg niacin. The bacon has 10 mcg selenium, or 14 percent of the daily value. The mineral selenium supports the antioxidant activity of vitamins C and E in your body.